I love consignment stores. I shopped at Boomerang Kids when my first son was 3 days old and he is now 5 1/2 and almost all of the clothing and toys that I have personally bought for my little guys have come from a consignment store. I just found out that Boomerang actually offers online shopping now! I am thrilled and thinking that my Christmas shopping just got a little easier. So when I saw this giveaway, I jumped at the chance to enter. This great Canadian blog called Mayahood is offering a $100 gift card for Boomerang Kids to Canadians. I am passing this info along partly because I earn some extra entries but also because I am a big fan of their stores. You can enter at: http://mayahoodblog.com/2013/12/09/boomerang-kids-consignment-shop-and-100-gift-card-giveaway or you can visit their website at http://www.boomerangkids.com/. While you are visiting Mayahood make sure you also check out the Hot Wheels Roto-Arm Revolution giveaway at: http://mayahoodblog.com/2013/12/02/hot-wheels-game-roto-arm-revolution-giveaway/#comment-2919. This would certainly look good under my Christmas tree and would make a 5 year old boy in my house very happy. I have been pretty quiet lately because things have been crazy around my house. Someone recommended I find my niche in order to grow my blog and I guess I am still considering what that is. That being said, I just entered a fantastic giveaway for a 4 pack of Ottawa Senators tickets and can gain extra entries by passing this information along. If you are in the Ottawa area and are interested in entering you can go to http://canadianbloghouse.com/broker4tickets-win-a-4-pack-of-level-100-tickets-ottawa-senators-vs-minnesota-wild-giveaway/. I was actually very surprised to read about the Broker 4 Tickets service which allows season pass holders to sell their unused tickets and gives people like me the chance to purchase tickets for great seats for a reasonable price. Why did nobody think of this before now? This is definitely something my hubby and I will be using in the future. Here is the latest giveaway. After reading the review, I would love to try this. Hope you feel the same and enter the giveaway. Good luck everyone! 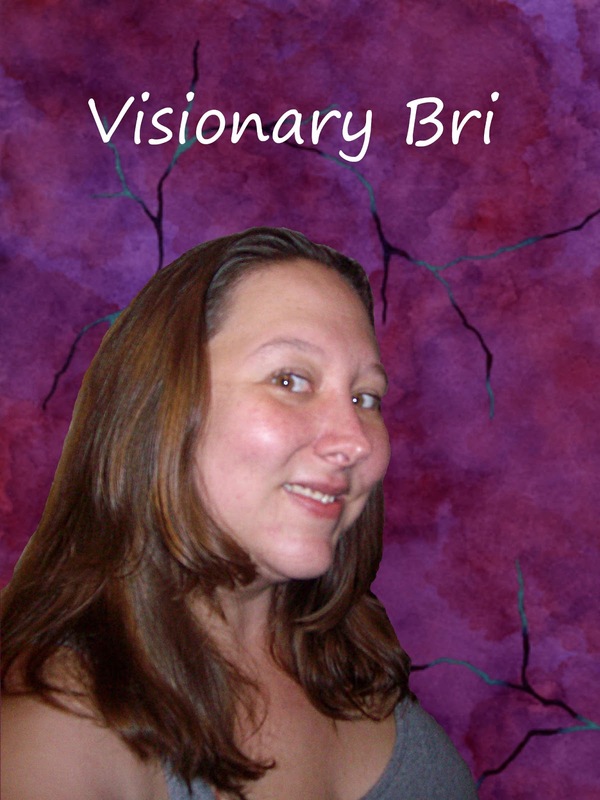 Another one-of-a-kind Visionary Bri giveaway! to bring you the OraMD Giveaway. Trusted Health Products sent me a bottle of OraMD to try out for myself. And I have to tell you that I've never been this blown away by a tooth care product. After one use, my mouth felt fresh-from-the-dentist clean. than some other "Dentist Recommended" toothpastes do with an electric toothbrush. You have to try this stuff to believe it! Even my 60 year old father is a convert. 1 bottle of OraMD original strength. Bloggers not responsible for prize fulfillment. Information may be used for marketing purposes by Visionary Bri. I am very happy to be participating in another great Giveaway. Unfortunately, it is only available to US residents. Sorry my fellow Canadians. I try to sign up for giveaways that include Canadians but sometimes it just doesn't happen that way. Say Hello Diamonds does ship to Canada, offers free shipping on orders of $100 or more and has some fantastic deals on gorgeous jewelry so I definitely recommend you check out their website at http://store.sayhellodiamonds.com/. For my US readers, enjoy the giveaway and pass it on! Welcome to the Pantina Earrings Giveaway! The Pantina Earrings from Say Hello Diamonds are by far the top selling diamond stud earrings. Each earring is 2 carats for a total weight of 4 carat Pantina earrings. they are set in cool, polished Sterling Silver and feature butterfly clasp backs. These earrings retail for $210 at SayHelloDiamonds.com. Pantina Earrings is excited to sponsor this giveaway and partner with GoPromoCodes.com. In addition to these beautiful Pantina Earrings, Say Hello Diamonds also sells rings, necklaces, bracelets, anklets and other jewelry accessories. They also offer free shipping on all orders over $100 and a fabulous deal of the day with savings up to 85% off. One lucky winner will win these Pantina Earings. To enter, just use the Giveaway Tools widget below. This contest is available to all residents of the US, age 18 and over. It will begin now and will end on July 29 at 11:59 PM PST. The winner will be picked at random from all of the entries by Giveaway Tools application. More terms and conditions are included in the giveaway form. Disclosure: I received no compensation for this publication. My opinions are my own and may differ from those of your own. Just Me N' My Guys is not responsible for sponsor prize shipment. Please contact the organizer of this giveaway with questions or to have your business or blog featured in the next big giveaway event. This looks like a product that I would love to try and I am very excited to participate in this giveaway. Here is all of the info if you are interested in participating too. Sign up, now. This is an awesome prize! I just found another great Giveaway that is taking place July 15-29 and had to sign up for it. Here are the details for now. I will keep you updated! Don't forget to enter the other great Giveaways that I am participating in: Swim, Sun & Fun (US only) hosted by A Lucky Ladybug and Savory Savings and $100 Summer Cash from Empowered Mommy. This event is free for bloggers to join. Bloggers can join this giveaway through July 12, 2013. Each blogger receives 1 free link in exchange for promoting this giveaway on their site and via their social media. Click Here to join!